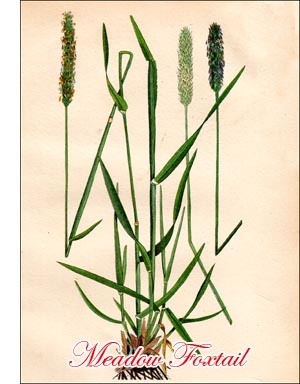 The resemblance that Meadow Foxtail bears to Timothy might be confusing were it not that the former, being one of the first grasses to mature its seed, begins to bloom a month before the green spikes of Timothy appear. The whole plant is more soft than is Timothy, the leaves shorter and borne on somewhat inflated sheaths, and the spikes are slightly softer, broader, and shorter than are the stiff, rough heads of the later-flowering grass. Meadow all soils but the driest, and after the early growth of May and June it yields later a luxuriant aftermath. Perennial, with short rootstocks. Naturalized from Europe. Stem 1-3 ft. tall, erect, not branched. Sheaths loose. Ligule very short. Leaves 1'-4' long, 1"-3" wide, flat, rough or nearly smooth. Spike (spike-like panicle) 1'-4' long, cylindrical, green, densely flowered, 4"-6" in diameter. Spikelets 1-flowered, compressed, 2"-3" long. Scales 3; outer scales acute, equal, united at the base, hairy on the keels; flowering scales nearly as long as empty scales, thin and translucent, obtuse, bearing a slender, dorsal awn about 3" long; palet often lacking. Stamens 3. Stigmas long. Fields and meadows. May to July. Labrador to southern New York, Ohio, and Michigan, also in Oregon and California.